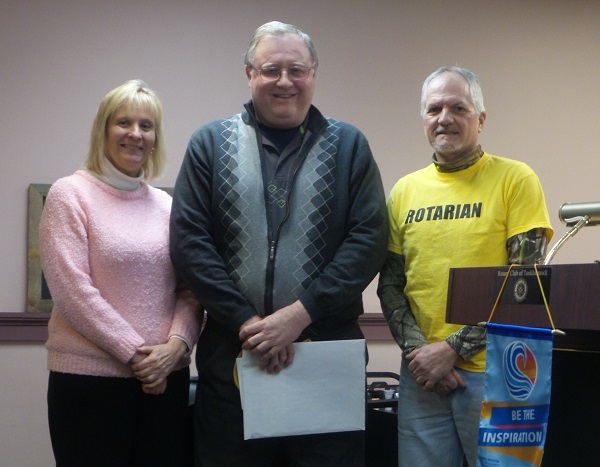 At the Jan 31, 2019 Tunkhannock Rotary Luncheon, Peter Sehne was inducted into Rotary by Membership Chair Ron Furman, Peter's sponsor was Anne Sehne, his wife, who had the pleasure of pinning him during his induction. Peter and Anne have 3 children, all of whom have been Rotary outbound exchange students. The Sehne's have hosted several inbound exchange students and entertained many of our District Exchange students. Peter commented that he really enjoyed interacting with the exchange students and now wanted to give back. For the last 17 yrs, Peter has been a prison guard at the Waymart Facility. He will be joining the Harvest & Wine Festival Committee.